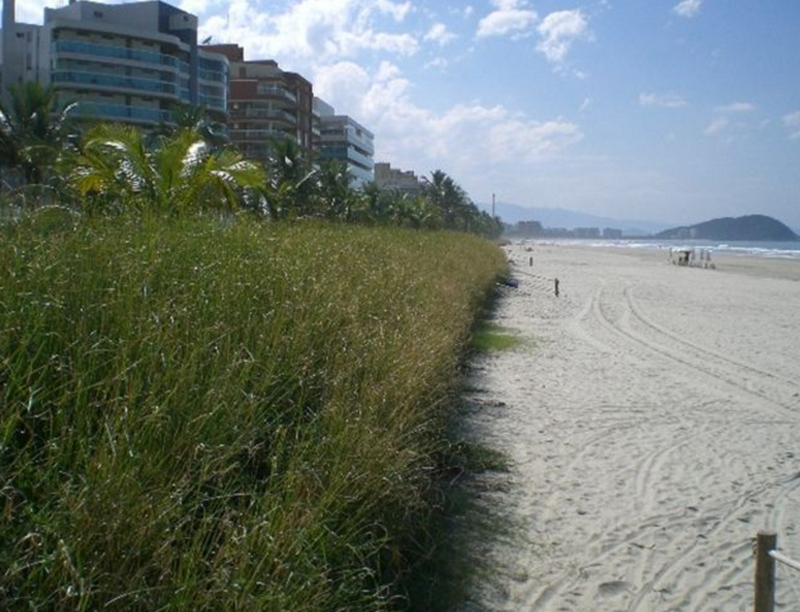 Vetiver Farms Hawaii Bach rErosion Control Solution Via The Use Of Vetiver Grass! I was born and raised on Maui and take a particularly strong stance on protecting the earth's environment. I competitively paddle for Hawaiian Canoe Club, and 3-4 days a week practice in the Kahului Harbor, Maui. Every season, a significant number of teammates get taken down by severe staph infections. I've known people to lose their eyesight, be taken into emergency surgery, and even move off of the island because of these infections. Our ocean is making us sick, and most days the harbor water is completely covered with a shiny brownish film of nauseating bubbles. I try to ignore this reality and the fact that the harbor is a stone's throw away from a sewage treatment plant. But, this article is not a sob story about my environmental viewpoint and my complaints about the risks involved with my recreational sport. It's about a simple, inexpensive, natural solution to the environmental crisis we're all part of, and the innovative company that stands bravely and competently behind this solution, Vetiver Farms Hawaii. Within a few moments of speaking with Jason Fox, the founder of Vetiver Farms Hawaii, I knew something about this company was perfectly opposite from the common business model, and it was refreshing to say the least. Their goal is to spearhead many large environmental Vetiver Grass projects in the state of Hawaii. As a consumer we get to purchase high-quality, locally made, eco-friendly products (including essential oils, vetiver bundles, etc.) that in turn support those projects and, the health of our environment. 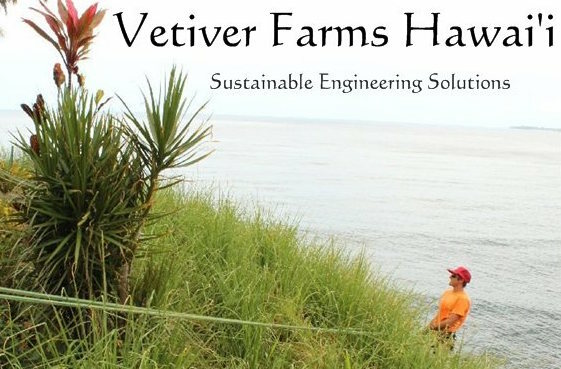 Located on the Big Island, serving locations all over the world, Vetiver Farms Hawaii, is made up of a team of environmentally minded scientists, engineers and technicians who spearhead sustainable farming projects with Vetiver Grass for all of following uses. Slope Stabilization / Erosion Control: Utilized for hillsides, retaining walls, highways, roads, canals, rivers, parks, landfills and beaches. An economical bioengineering alternative to steel and concrete that can far outlast conventional methods while leaving a positive impact on the environment. equivalent to having twelve-foot steel plates in the ground while allowing soil and water to be filtered. One plant is comparable to a 4 inch diameter steel bar anchoring the soil 12 feet deep with a network of roots approximately 1/6th as strong as steel. Giving it the nickname "Living Steel". Cleaning of Residential and Industrial Wastewater (Bioremediation): Scientifically proven to reduce nitrate and phosphate levels by up to 90%. Vetiver is commonly used in cleaning algae blooms and wastewater effluent treatment, while also trapping sediment. Land Reclamation (Phyto-Remediation): Vetiver Grass absorbs toxins into their root systems preventing further contamination of food and water sources. Toxins include antibiotics, pesticides, herbicides and heavy metals such as mercury, arsenic, lead, cadmium, copper, zinc, selenium, nickel, and chromium. Organic and Economical Disaster Mitigation: Vetiver provides long term protection against earthquakes, fires, flooding, potential landslide sites, and tsunamis. Flood Prevention/Pasture Improvement: Vetiver diverts water and acts as a slow release sponge for run-off and is used for groundwater recharge and biomass. It is also used around the world to increase soil fertility and provide livestock forage, as well as being used to help establishing native trees. Purity and quality is absolutely guaranteed when it comes to products by Vetiver Farms Hawaii. All of their plants used to make their line of handmade products are grown on their regulated, clean, organic, 28 acre ranch, located on The Hamakua Coast, on The Big Island, in Hawaii. Skin, Hair & Beard Tonic - Nourish your cells, tame your mane and smell like an aphrodisiac. This tonic has our Hawai'i Vetiver, organic cedar, Organic Aloe and pure magnesium in a base of organic fractionated coco oil. 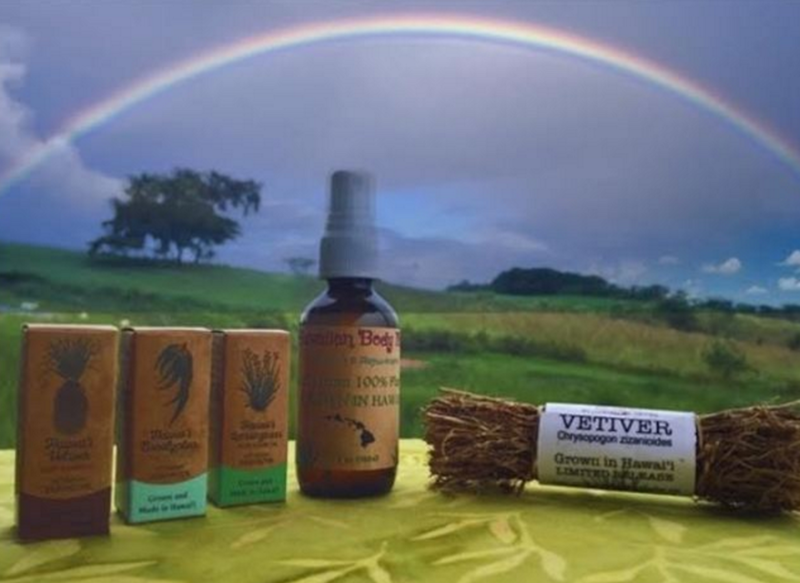 Mana Foods Vitamin Room specifically carries the following Products By Vetiver Farms Hawaii. At Mana Foods we not only carry and highly recommend their line of products, but are inspired and in awe of the way they run their business. Therapeutic grade Lemongrass Oil - A Tranquil and Uplifting/energizing essence that helps to fight fatigue, and ease stress and depression. Holding the compound of citronella this is a great natural mosquito repellent, and also a popular oil to help combat dengue fever in Hawaii. It is also known to alleviate pain from headaches, as well as body aches and pains associated with overexertion. In the end, Vetiver Farms Hawaii is the diamond in the ruff, the humble hero, and the reminder that there are companies genuinely driven by giving back to the greater good. My wish for all of us and the planet is that we join together to support Vetiver Farms Hawaii to help save the only home we have. Let's educate ourselves and others about Vetiver Grass, and push to implement Vetiver Grass projects in as many places as possible. And, hopefully one day soon we'll realize that once we stop making our planet sick with pollution, the Kahului Harbor, and many other places alike, will stop making us sick. As for me, I'm just a girl from Maui, who paddles, surfs, loves the ocean, fights for the environment, and am eternally grateful for companies like Vetiver Farms Hawaii and Mana Foods. Aloha! To learn more about Vetiver Farms Hawaii visit their website atwww.vetiverfarmshawaii.com and follow them on Facebook and Instagram.